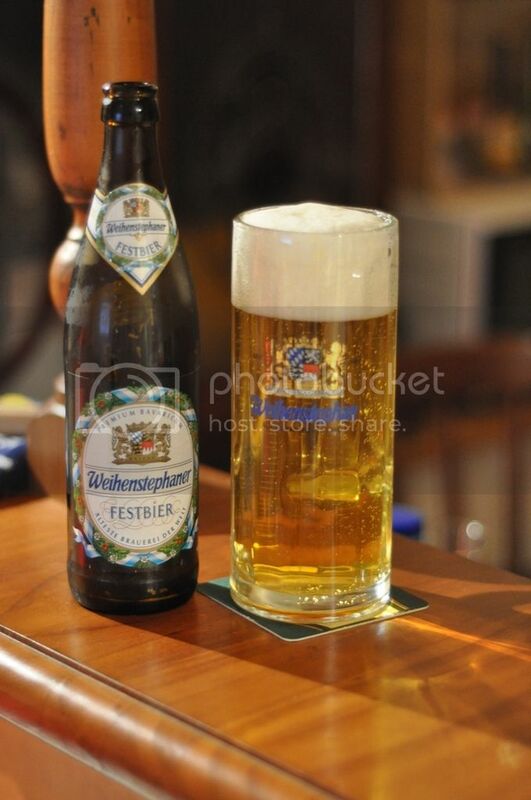 This is this years Festbier from the world's oldest brewery; Weihenstephaner. This brewery has been producing beer since 1040, so closing in on it's 1000th birthday! And all of the beers they produce are magnificent and show their experience. So in recognition of Oktoberfest which started last weekend this is the review of Weihenstephaner's 2011 edition of the Festbier. This is what all those at Oktoberfest are drinking right now. I'm looking forward to it, so I've got really high expectations. The pour of this beer is very surprisingly crystal clear apple juice colour! It has a very shortlived large head which pales away to nothing by half way down the glass. The head is quite airy and has almost no substance to it. Most Marzen beers are quite dark in colour and are quite cloudy. This is nothing like a normal Marzen beer but it is still a very nice looking beer, just not indicative of the style. This beer is very delicate on the nose like most Marzen beers, and particularly Weihenstephaner beers. There are subtle pale malts and some very light floral Noble hops. It smells slightly spicy, but really quite mild. A lovely aroma that doesn't really give away what this beer will taste like. However I feel that this peaks my interest more when you add this to the colour. So the flavour is very simple. This beer doesn't take the traditional Marzen route of ridiculous ammounts of maltiness, instead it is quite sweet with a very mild pale malt. It's the very rich Noble hops where this beer stands out. They are spectacularly floral with a very minor citrus flavour, really excellent. It's very light in the mouth with moderate-low carbonation and the bitterness is almost non-existent. Wow you could knock back alot of these! In summing up this beer you wouldn't say it's exceptional, but it is still very good. It is not a Marzen beer by definition, but it is perfect for Oktoberfest! This beer will cool you down during the heat of the German sun, and will certainly warm you up if you have enough of them. It's such an easy beer to drink as well, infact I'm going to go have another one. If you see this beer go and get some for Summer, it won't let you down.